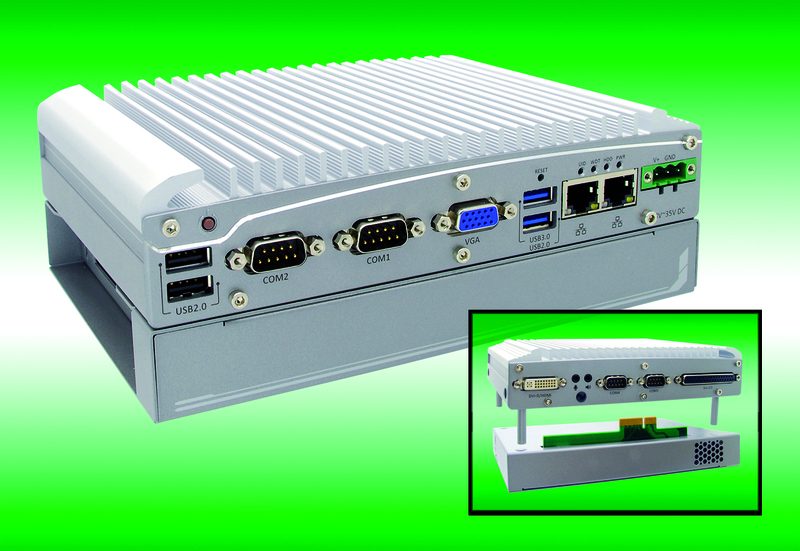 The Nuvo-2500 is embedded PC needs for all-round use. It has high processor performance, robust, service-free casing, a compact construction as well as a large number of interfaces which are already integrated. In particular its already installed interfaces as possible PCI /PCIe extensions make this controller interesting in the current Internet of Things (IoT) und Automation 4.0 application range. The economical but high-performance Intel Celeron Bay Trail J1900 quad core processor forms the core of the fanless Nuvo-2500. The working memory can be extended to 8 GB DDR3 RAM, a SATA HDD slot and an mSATA socket are available for mass media. The compact and robust chassis is designed for harsh industrial use at a temperature range from -25 to +70°C. It is comprehensively equipped with standard interfaces: these include two gigabit Ethernet ports, USB 3.0, USB 2.0, 4 COM ports, DIO as well as 4 analogue inputs which are provided. With its four extension slots (1 x PCI, 1 x PCIe, 2 x Mini-PCIe), the Nuvo-2500 can be equipped flexibly for different tasks and is easy to integrate in vision systems, automation or machine communication applications as well as for motor control and remote servicing. The patented expansion PCI / PCIe slot cassette simplifies the installation of specialised cards and also accommodates three-level heat management. At the first level, the insulated cassette ensures that the system’s heat load is not or only slightly increased by an additional card. The made-to-measure heat sink immediately conducts the heat to the surface of the chassis. The option to integrate an intelligent fan directly in the housing is available for particularly powerful expansion cards and special environmental conditions. The internal I/O interface incorporates four insulated digital inputs, eight insulated digital outputs, 6PWM outputs (pulse width modulation), a quadrature encoder input and 2 analogue to digital converters. This enables controlling motors, positioning mechanisms and a large number of other peripheral devices directly with the integrated hardware without occupying an expansion slot. Thus, flexible servo motors, stepper motors and DC motors can be controlled flexibly by the Nuvo-2500. The Mini PCIe slot with an USIM socket extends the network compatibility with the option to integrate wireless communication technologies such as 3G, LTE, WiFi and BT directly.